I’m not sure what year this was. I don’t know what “Projectoscope” means. But — even if it didn’t live up to its promise as “the best program ever given here” — it must have been pretty cool. I do know one thing: the Opera House where D.W. Robertson presented his famous, marvelous Projectoscope is still around. Today though, we call it Toquet Hall. This entry was posted in Friday Flashback and tagged D.W. Robertson, Projectoscope, Toquet Hall. Bookmark the permalink. thanks, I enjoyed the history. So this might have been the first movie ever shown in Westport? 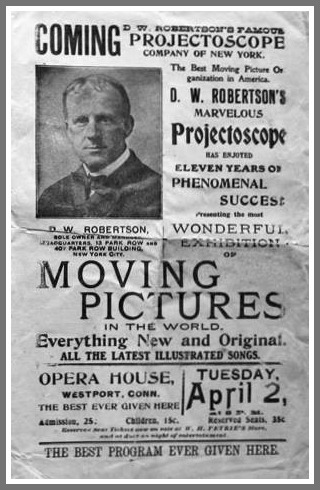 D W Robertson was an early showman that acquired an early Edison film projector that he called a Projectoscope. He gave illustrated lectures in the NYarea. The poster probably dates around 1900. Any guess as to the year? Or approximation? Fascinating! Mitchell, thanks for great link too for the 1907 showing here. We all that to Otocast! wow. We were quite the up and coming and progressive town!